What kids don’t like a friendly dog? Well – I guess once in a while we run into a kid who has never been around them, and perhaps find them to be a little intimidating – but overall, kids come to the door and see that we have Blue and Brody and they get super excited and obsessed with the dogs. That’s great, because the dogs like the attention – especially Brody. We get a break from their neediness, and they get some exercise and extra socializing too. 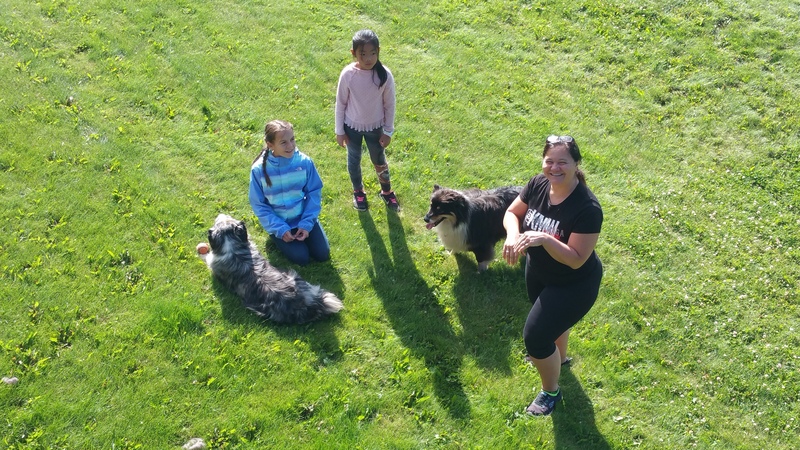 Usually in the morning, after breakfast, Maria will wind up showing the children the tricks she has taught her dogs, like how they roll over in unison for a treat, or how they can jump through a hoop. Of course they fetch and shake hands and sit and lie down and all of the typical doggy tricks that kids find fascinating. I think kids also feel a little bit of power and sense of accomplishment when they can cause a dog to do what they ask. Today I took a few candid shots from the upper deck while Maria and the children from New York and Florida played in the lower yard. If you are looking to travel and Homer is one of your stops – I’m pretty sure you and your kids will love it here! These kids got to play and learn and enjoy with these fun dogs and this lovely background, and the parents? They sat on the deck and basked in the sun, knowing that their kids were fully occupied and in good hands. I’m sure a few minutes of not having to be 100% responsible was nice for them too.